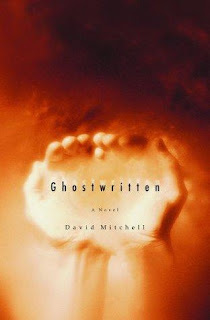 David Mitchell's debut novel, composed of nine loosely interconnected stories that stretch across Asia and then towards the west. I read Mitchell's Cloud Atlas earlier this year, which featured a set of six interconnected stories. Where Cloud Atlas's stories were nested, and moved forward and then backwards in time, the stories in Ghostwritten take place in roughly the same time and universe. As in the later work, these stories are connected not just by character and coincidence, but also by themes and ideas. Ghosts appear in all the stories, but in various forms - from literal haunting ghosts to ghostwriters to sleeper agents to... well, no spoilers. It is hard to talk about this novel without using the phrase "astounding debut." This is a first work by a writer who was just 30 at the time this was published, but his confidence and ambition is stunning. He begins moving through Japan to Hong Kong and then into mainland China, establishing a startling sense of place and building (mostly) compelling primary characters for each segment in relatively short stories (each of the first seven stories are around 30 pages). Ignoring the quality of the writing for a moment, you have to pause and admire the gumption of a debut novelist who starts off with a brainwashed cult terrorist on the run in coastal Japan, seething with disgust for the local masses of unconverted. Anger, fear and rank delusion right from page one, and then we are off across the landscape of the world. With each section, there is a shift in perspective and sometimes in style and tone, though much less so than in Cloud Atlas, where each section is written in a different dialect and genre. The bulk of the stories could work as interesting standalone short stories, though some of the later stories build a little on earlier stories. The second story was a particular favourite of mine: a stalled young Japanese man in Tokyo has ensconced himself in a record store, surrounded by the jazz he loves, but conscious that this isn't where his life is likely to lead. A very sweet and simple love story sets him back off on a journey again, but I was invested both in the journey and in his contemplative stasis. The fourth story ambitiously attempts a history of modern China from the perspective of a woman running a lone tea shack on the side of Holy Mountain1, from her despoiling as a girl by a warlord's son in the late feudal era, through the cultural revolution to the modern day. After five excellent and distinct segments, it was almost a relief to find that Mitchell hadn't sold his soul for unearthly powers. The sixth segment is an underwhelming art caper in Saint Petersburg, Russia which I dragged myself through with some effort. This section lacked the sense of place that many of the others had, and the primary characters largely bored me. The seventh segment moves to London, and while it isn't the strongest in the novel, I perked right back up. Perhaps Mitchell intentionally let his tightness slip here, before the novel starts accelerating towards its gasping conclusion? He has the skill and the balls to manipulate the reader this way, but I somewhat doubt it. I could imagine him jerking the reader around a bit with a referential but implausible story2, but I can't imagine him intentionally letting the mood and landscape belly flop. The connections between stories read more like Easter Eggs than critical to the story; companies and people and stories that pop up and satisfy our need for connection, but don't necessarily inform the plot. And there is something of a major plot arc here, I think, though it is somewhat hard to elaborate. Since the traditional novel forms are eschewed, the reader needs to work harder to grasp at the whole. Because the plot (if there is one) is tangled with the reoccurring themes and ideas, the reader is pushed into thinking more about ideas than activities. Or rather, that was my approach - I think that the structure encourages a deeper reading, but doesn't insist on it. You could stroll through this as a collection of crisp short stories or as character studies. Overall, I didn't like this as much as I liked Cloud Atlas, but it did feel less ostentatious. In between these two books, he wrote number9dream with some similar choices and themes, which certainly gains a spot on my "to be read" list. Apparently Mount Emei, the highest of the Four Sacred Mountains of Buddhism in China. I raise this mostly because he does do something like this in Cloud Atlas, and it worked for me. However, in that case each nested story casts its outer story as potentially fiction and definitely as text or other media, and some of the inner stories critique the outer ones. There isn't that sort of internal interaction with text here, though. Without one section explicitly commenting on another section, which doesn't happen here, I am not sure it makes sense.